Clinical study of vaccine against the deadly dengue virus conducted in the Philippines and other Asian countries made its promising result. It will be available and to be used around the world in mid-2015. Over ten thousand (10,000) children from San Pablo City and Cebu in the Philippines, as well as Indonesia, Malaysia, Thailand and Vietnam participated in clinical trials for this vaccine against dengue. After 3 years, the vaccine against dengue got its successful result for about 56.5% efficacy or effectiveness. Decreases for almost 88.5% Dengue Hemorrhagic Fever in children ages 2 to 14 years that were subjected to examination. Research Institute for Tropical Medicine (RITM) ensures that the vaccine is safe to use. "The result shows for the past two years that it’s a very safe vaccine." But the company Sanofi-Pasteur is waiting for test results from Latin-America before processing the permit and regulatory requirements to sell the vaccine in mid-2015. "They are looking for sub-distribution of vaccine into highly endemic countries—and Philippines is one of them. In a privilege way to get all the access to the vaccine and to be in a condition as soon as possible to protect people who are expose to this disease nowadays." Every Dengue Victims Need This! The Department of Health was glad because dengue cases in the Philippines is huge that hundreds of people die for there is no vaccine yet. 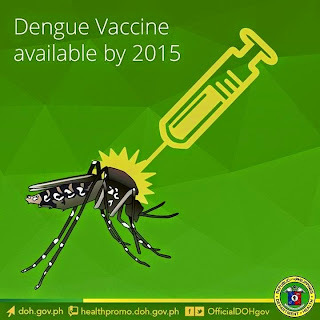 Now, the problems are... we don't know how much this vaccine may cost and also not certain whether the government or the private sector will hold the distribution of this anti-dengue vaccine in 2015? The Sanofi mentioned that there are three infusion or shots to be injected within a year to be fully protected from 4 strains of dengue virus. Thank you for reading Anti-Dengue Vaccine Available Next Year posted on the website Kwentology if you want to redistribute this article please include the link as the source. Have some kuwento to share? Contact us!